This is a Interest / Waiting List! It's been more than two years since I started this so please have patient with production, I'll make these kits when I find the time so waiting time may vary and be long! I'll get in contact when it's your turn and I don't want to take pre orders or money in advance, it's fine to refrain from buying this kit or if you wish to make some changes when the turn comes to you, PayPal payment in sek before shipping after the kit is finished, with currency rate at the time. A 5% donation will be generated to Pinside for each sale. An Initial Batch of 10 kits will be made at first and evaluated. 1 Kit/Member as a start for these first 10 kits! I'll have to set some limits for coming orders as well depending on interest, about 2-3 kits/member to begin with. This kit replaces the inner bracket, all five metal rollers, their washers and the upper brace. 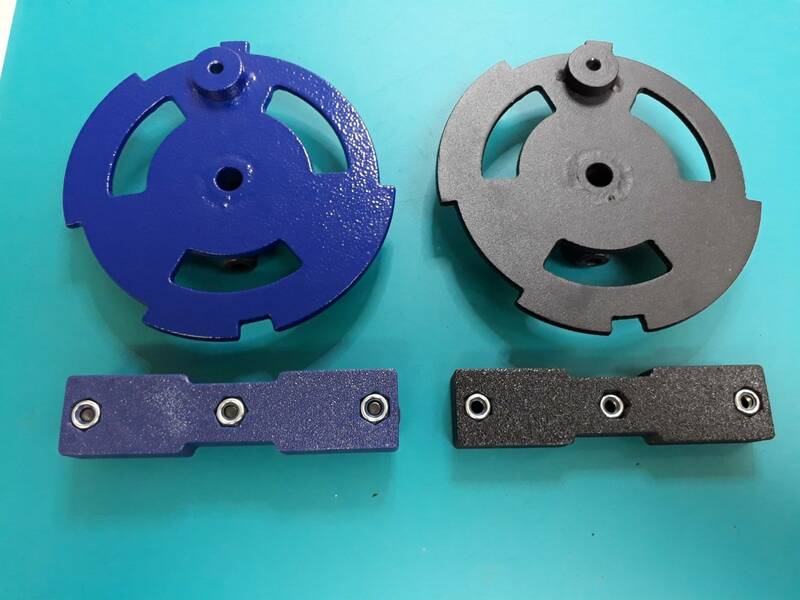 In order to install this kit you need the outer bracket with optos, a fully functional motor and gearbox with its bracket, these parts should be intact without any major damage. Three holes in the bottom of the Outer Bracket has to be drilled to install the Bottom Reinforcement. If you choose to use the Original Cam, a 5mm hole has to be drilled through the small shaft and a piece of one opto slot has to be cut away to achieve correct height in the middle lift position. #1 IGUS Type Bearing of Solid Polymer RJMP-01-06, these bearings was what I initially planned to use but they were not available for the thinner shafts on the MkI Kit, these are what I recommend! #2 Linear Ball Bearing LM6UU, used on the MkI Kit, still working fine in the MkI Beta kits. #3 Self Lubricating Graphite Brass Bearings JDB LM6UU LM6, not tested and more expensive, these will be sold separately as an option but I don't consider them to be suitable for this application. * Some parts is now being FDM Printed in PC and PETG. * New design for the Upper Linear Shaft Bearing Unit for the Larger Bearings. * New design for the Lower Linear Shaft Attachment for the Thicker Shafts with damping and more material for the shaft attachments. * Bracket Chims of PETG for leveling the Mini Playfield against the Playfield included. * Modified Cam available as an Option, the Original Cam can still be used but has to be modified as in the first kit. * Brass Connecting Hex Rod instead of Aluminium, Aluminium still available. # The Lower Linear Shaft Attachment PC. # The Upper Linear Shaft Bearing Unit PC. # The Outer Linear Rail Attachment PETG, Aluminium available as an option. # The Outer Bracket Bottom Reinforcement PETG, Aluminium available as an option. I've researched and tested different types of plastics and brands for these parts and found what i required in desired strength and toughness, these parts are all 100% Infill PETG and PC (Makrolon/Lexan). The Upper and Lower Linear Shaft pieces can be developed if therés a demand of Aluminium instead, but pricing will end up above 3000sek for a complete kit of Aluminium. Inner Linear Shaft parts of PC is made in Black only. 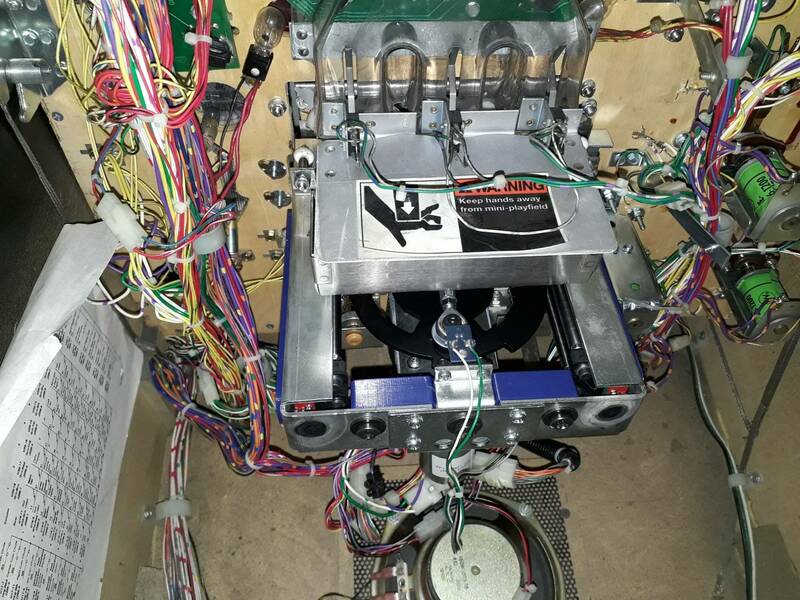 Parts attached to the Mini Playfield is still made from aluminium, the kit have not yet been confirmed to fit with the cpr repro mini playfield. Basic Kit 1800 sek + Trackable Shipping, Postnord prices 190103; USA & Canada +147,20 sek, Europe +184 sek, Sweden +63 sek. 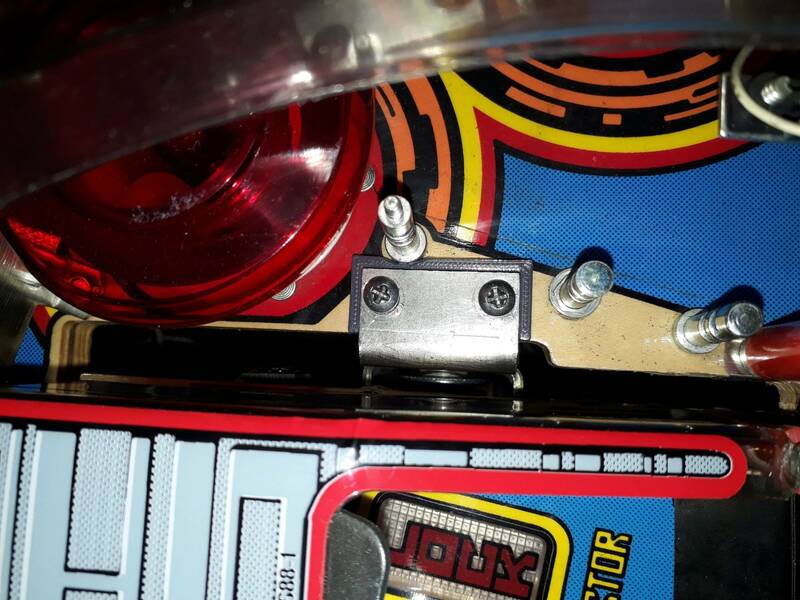 Thanks to dahlman at Degerforce Pinball for development of the Modified Cam that Im now able to offer for sale as well. This Cam has correct height for the elevator in both middle positions. Note that this Cam has a Round hole and is missing the D arbor hole, it has two sturdy set screws instead and is made of thicker sheet metal, this Cam has been up for testing during the past 6 month now, limited at this point to one/kit. 1pcs Modified Cam, One Offer/Kit, 600 sek, Raw Sand Blasted Steel if you wish to paint it yourself + extra shipping cost, Postnord prices 190103; USA & Canada +64 sek, Europe +80 sek, Sweden +32 sek. Add +100 sek extra for Black Matte powder coated version. 2pcs Outer Linear Rail Attachment in Aluminium instead of PETG, with Logo and Unique Tag/Three Digit/Letter/Symbol, add 500sek. As an example there will be only one WHO Kit made, payment before engraving though. 1pcs Outer Bracket Bottom Reinforcement of Aluminium with Logo instead of PETG, add 200sek. Therés No Guarantees with this kit, All work, installation or operation with the elevator is at your own risk and responsibility! I'll do my best to support you though. This is mainly functional parts, visible imperfections will occur on some surfaces! This kit will not solve any problems if you're using a bad gearbox with Stripped Gears or a Wobbling Main Shaft. Any additional extra costs like customs, taxes or PayPal fees is not included, shipping prices may vary. Put your interest in this thread If you're fine with these conditions. Add which options and colour you want, not necessary but it's helpful when I'm buying more material. Claim your TAG/Three Digit/Letter/Symbol if you're looking to buy the Aluminium Outer Linear Rail Attachment Option. darkpinball last edited this post 48 days ago. Really interested! Thanks for your hard work! Basic Kit 1800 sek + Trackable Shipping, Postnord prices 190103; USA &amp; Canada +147,20 sek, Europe +184 sek, Sweden +63 sek. 1pcs Modified Cam, One Offer/Kit, 600 sek, Raw Sand Blasted Steel if you wish to paint it yourself + extra shipping cost, Postnord prices 190103; USA &amp; Canada +64 sek, Europe +100 sek, Sweden +32 sek. Any additional costs like customs or taxes is not included, shipping prices may vary. Please add me to the list. Great job!! Please add me to the list as well, This looks amazing! Nice work and Thank you. The first MkII kit that Ive been working on is now installed locally where I live, middle height was 1mm or 3/64” higher than the expected 46mm or 1-13/16” in the middle position on this bracket when Main and Mini Playfield was perfectly leveled and height adjusted against each other with the modified Cam, no affect on game play. The bracket needed height adjustment on the right (pop bumper) side with a 1.5mm shim, so far it has been a bit lower on that side with the brackets Ive worked on, had to trim the shim a bit because of a post, Ive changed it in the cad and uploaded them to Thingiverse in four different heights if some one wants to use them to shim the bracket, 0.5mm, 1.0mm, 1.5mm and 2.0mm. The Bottom Bracket Reinforcement is uploaded as well in two different versions, metric with M6 screws and inch with ¼” screws. These two designs can be used in the original elevator setup without the kit. Oh heck yea. Put me on that list! Kit + Cam w/Aluminum. I'd ALSO like the PETG in blue so I have it for future options. Let me know when you need $$. Interested in Kit + Cam. Any idea on time frame? No problem, Ill include PETG parts with aluminium options, no extra charge, at least for these 10 first kits. No need for payment until its time for shipping. 5-12 weeks is realistic for the first batch of 10 kits, Ill ship according to interests in this thread. Yep. I’m interested. Put me on the list. Put me on the list as well. Kit and cam thanks! Just checked in on the old thread... found this one. Please add me to the list for the new MKII kit! Thanks. I will use the original Cam. I prefer Sapphire Blue RAL 5003 for the outer linear rail and PETG bottom reinforcement. I bought a new DW! I missed out on testing the first kit because I had to sell mine over a year ago.. well I got one back! I’d like to be added to the list. Both the main kit and cam. The first kit has been shipped, I intend to ship one more during this week. 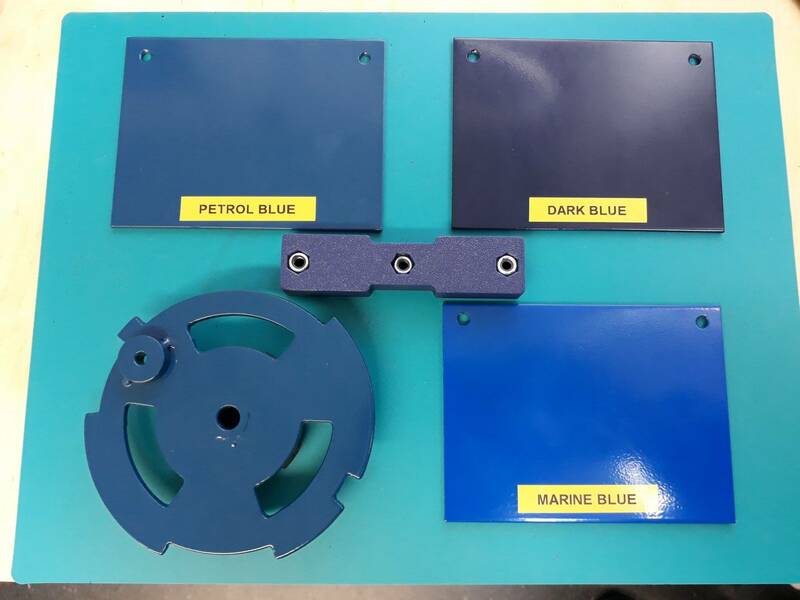 Most parts are finished and more material for the modified cam has arrived so that will keep me busy, Ive ordered four different Blue powders for the Cam since the Blue PETG is the popular choice, hopefully I can show powder coated samples during next week. Added the Outer Linear Rail Attachment .stl file on Thingiverse and Shapeways. I recieved three of the four blue powders i ordered since one was discontinued, one cam has been coated with the Petrol Blue and shipped, I will order another shade of Blue. Sounds great! Please add me to the list (kit + cam + aluminum). Thanks! Please add me to the list for complete kit. Please add me as well. Thanks for doing this! Seriously folks, you'd better get this and tell your fellow Dr. Who owners to get in line ASAP. Lots of work went into this. I doubt anyone else will ever repeat what has been done here to preserve the game for all time. 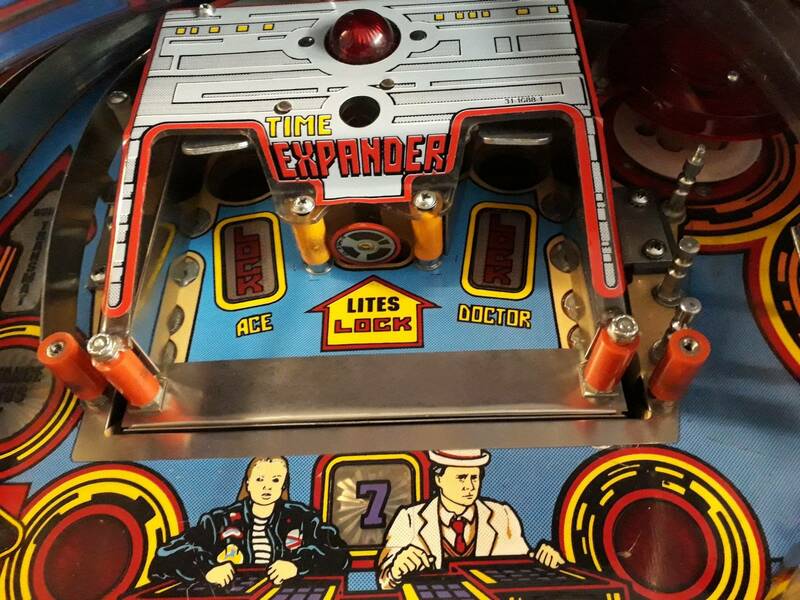 BTW, Mk.1 version still running strong at Roanoke Pinball! The kit is very easy to intall. The directions are clear and guide you through nicely. I only had a few instances where I had to email Ulf for clarification qnd he gave excellent direction and support. I will be uploading all my progress soon. Put me on the list as well please ! I'd like to get on the list for a kit + cam. Eight kits has been assembled and shipped, parts for the next batch will be made during the summer and shipping starts when I have some more feedback from the initial batch, 25-30 kits are probably as many as will be produced during this year totally. Sapphire Blue for the cam is the closest to matchning the PETG parts so far, available in rough textured glossy and fine textured matt, same textured options is available for Black. im in for one of these please.what do you require from me at this time? I'm also very interested. Please advise me on how to purchase! Add me to the list. I may need 2. Wow, cool. I have a DW machine that I really need to revisit. Add me to the list also? We will take a kit with cam whenever available. This summer I’m restoring 2 games - TZ and DW; hoping to get a kit installed this year! Great great idea, probably best mod ever! Please put me on the list as well! Please add me to the list for a kit and cam (bare). PM sent. Awesome work!